Biosemiotics is an area of research that studies living matter in terms of its communication networks, i.e. the transfer of signs. Biosemioticians think that the exchange of signs applies to whole organisms communicating with one another (as when humans or other animals communicate), but also the exchange signs at the microscopic and chemical level, including the way cells process DNA. Signs require interpretation, and it is here that biosemiotics brushes up agains theories in hermeneutics. Anton Markoš is in a group at Charles University in Prague exploring biology from the point of view of semiotics and hermeneutics. His interesting book Readers of the Book of Life explores relevant writings by Martin Heidegger and Hans-Georg Gadamer. It’s worth looking first at what they think of as a conventional view in biology of DNA processes. Biologist Richard Dawkins in The Blind Watchmaker explains how genes steer the development of an animal embryo. Genes are the recipe for the organism’s development. “Embryonic development is a process. It is an orderly sequence of events, like the procedure for making a cake, except that there are millions more steps in the process and different steps are going on simultaneously in many different parts of the ‘dish’. Most of the steps involve cell multiplication, generating prodigious numbers of cells, some of which die, others of which join up with each other to form organs, tissues and other many-celled structures. … In any one place in the developing body, at any one time during development, only a minority of the genes will be switched on. In different parts of the embryo, and at different times during development, other sets of genes will be turned on. Precisely which genes are switched on in any one cell at any one time depends on chemical conditions in that cell. This, in turn, depends upon past conditions in that part of the embryo” (296). The recipe metaphor is as plausible as any, and has currency amongst biologists, but it is under challenge from various quarters, including from semiotics and hermeneutical philosophy. I couldn’t find “languageness” in the OED, but the term seems to generalise language to any kind of exchange. It could also indicate access to a primary kind of language that precedes what is spoken and written — a protolanguage. It’s important for Markoš to extend language to the unspoken as he wants to describe what happens inside cells in terms of language. He thinks of a cell is an interpreter or reader of DNA. Here he echoes a standard hermeneutical description of how a human reader engages with (i.e. interprets) a text. One of the threads he develops in support of his argument notes the presence of redundancy in the text that is the genome. Much of the DNA sequence in a genome is superfluous, or it just holds the strand together, or switches on or off as the context changes, or serves as backup if other strands fail due to mutation. That’s a lot like spoken language, in which there are many substitutes for a word. He illustrates with the word “dog.” The word carries different meanings (or uses) depending on context. “Dog” can refer to the animal in general, the male animal, an insult, a creature that is crude, difficult or insistent, and “dog” has many grammatical forms and substitutes (doggy, dogged, mongrel, hound, pooch, puppy) which offer different meanings depending on context. Words in spoken and written language shift and change and require interpretation, as does the whole passage, book, or corpus in which the words occur. So too, the words of a DNA strand require interpretation in terms of their place within the bigger context of the organism, population, and environment. Markoš’s argument treats the cell as an interpretive agent. This attribution of the capacity to interpret beyond the limits of the world of human agency engaged in spoken language provides a provocative departure not only from genetics but also from mainstream hermeneutical study. It’s useful to think that interpretation works all the way through the organism, from the thinking human in society down to the cells of which a person is composed, and spans across all living things. This is part of the message of biosemiotics, that the exchange of signs, verbal and otherwise pass through the entirety of living systems. But Markoš’s recruitment of hermeneutics in this cause raises a couple of issues for me. What a cell does with its DNA doesn’t sound like what a reader does when they interpret a text. For example, there’s the question of whether it makes sense to assert that a cell has any part in the kind of reflection that explores and explains philosophy, art and culture, and not only interprets but thinks about interpretation. There’s also a question about the authority Markoš accords to biological models. Hermeneutics would more likely treat the existence, structure and function of the cell as a model, i.e. an extremely useful construct invented by human beings. It is the genetic model that is to be read and interpreted, and the best means we have for engaging in that kind of analysis is human language. By my reading of the tenets of hermeneutics, to presume the existence and primary status of the cell goes too far in according authority to the existence in nature of elements that exist independently of our theorising about them, i.e. independent of our human reasoning and understanding. Hermeneutical scholarship seeks to show that scientific discourse, experimentation, theorising, model building, evidence gathering and many other research practices involve processes of interpretation in all their aspects. That’s not the same as saying that the objects identified through our interpretive practices are themselves interpreters. The quotes from Markoš are mainly from the sections: Proteins Emancipated; The Text and Its Reader. Some quotes don’t have page numbers as they are taken from Kindle editions. The first picture is an egg that missed the baking bowl. 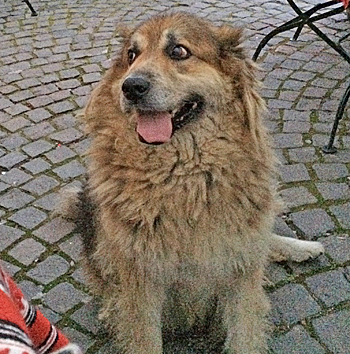 The second is a stray dog outside a cafe in Sighișoara, Romania. Markoš, Anton. 2002. Readers of the Book of Life: Contextualizing Developmental Evolutionary Biology. New York, NY: Oxford University Press. Kindle edition. Markoš, Anton, Filip Grygar, Karel Kleisner, and Zdeněk Neubauer. 2008. Towards a Darwinian biosemiotics: Life as mutual understanding. In Marcello Barbieri (ed. ), Introduction to Biosemiotics: The New Biological Synthesis: 235-255. Dordrecht, the Netherlands: Springer. While not wanting to look like I’m blatantly plugging my new book(! ), I can’t help thinking that Merleau-Ponty would agree with the ‘hermeneutic biology’ view. The way he talks about the ‘reversibility’ between perception and perceptability suggests that he would also accept that there is some form of interpretation/interpretability all the way down to the cell – and of course also ‘all the way up’ to society and culture-nature as a whole. Perhaps including this larger context as part of the interpretative apparatus also makes it a bit easier to accept that there is interpretation going on at all levels, ie that objects also interpret us, in however minimal a way, as suggested in Graham Harman’s ‘object oriented ontology’.